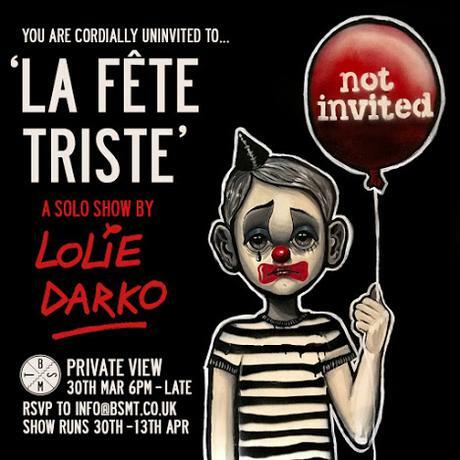 BSMT Space are proud to announce that French artist Lolie Darko will be showcasing her enchanting, big-eyed paintings in her first solo show 'La Fête Triste' here at the Dalston based gallery! In this gloriously sullen and dark affair Lolie will be challenging our preconceptions in her thought-provoking artwork which depicts a cynical reality sustained by these sad, watery-eyed children as well as our views towards this naive vision of innocence. Lolie paints walls in both Paris and London, using brushes and spray paint to deliver her topical message of disillusionment. For her solo show she has translated the same dismal imagery onto canvas, using either acrylics or oil paint for more detailed rendering. Join us for this splendidly dour celebration! Open to the public from March 31st- April 13th. Additional details on the Facebook event page here.